This feature of smart thermostat uses a smart phone’s GPS chip to establish a perimeter around your home. When you leave, you presumably no longer need to heat and cool your home…or you can at least have the thermostat adjust the temperature so that it’s not running unnecessarily. 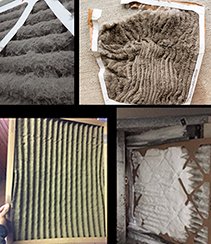 When you return home and cross the perimeter again, your HVAC system will kick into action so your house is comfortable by the time you walk in the door. Programmable thermostats were the first to boast energy savings. But, do you know that only 18% of all programmable thermostats even get “programmed”? It true and it’s because programming a thermostat is no easy task. Most folks want to set and forget it. With smart thermostats, the most sophisticated feature has to be the self-programming and scheduling. By virtually understanding occupancy and routines, smart thermostats learn your patterns for energy usage can program themselves for your greatest energy savings. Many provide monthly reports to your email that tell you about your usage increases and/or decreases and make suggestions for improvement. Armed with that information, a homeowner has ability to reduce energy usage by as much as 30%. Wi-Fi features of the smart thermostats all include control from an App. This means you have complete access to the thermostat anywhere you have connectivity to your smart phone or tablet where the App is located. This permits control of your thermostat from afar: you can check in and adjust the temperature, turn the HVAC system off, reprogram it for a scheduled change and do anything you could do by being at the thermostat. Most smart thermostats now come with (or you can add on) indoor air sensors. Before, most old thermostats measured and controlled a home’s temperature in just that one spot–where the thermostat was located. Trouble is, that spot was usually in a hallway or somewhere else that you never spent any time in. Now, smart sensors allow you to set the temperature of the home from multiple rooms in your home, so you’ll always be comfortable where you are spending your time. Every Wi-Fi thermostat comes with an App so you can control it with your smartphone or tablet, but the best models can also be integrated with other smart-home devices and broader smart-home systems. This can range from being able to adjust the temperature with a voice command via an Amazon Echo or Google Home digital assistant, to linking to your CO/smoke detector so that your HVAC system automatically turns off when fire is detected, preventing CO or smoke from being circulated throughout your home. Other options to consider include tie-ins with cameras and home security systems. The Wi-Fi thermostat becomes just one product within an entire eco-system of your smart home…all controlled from the same App. 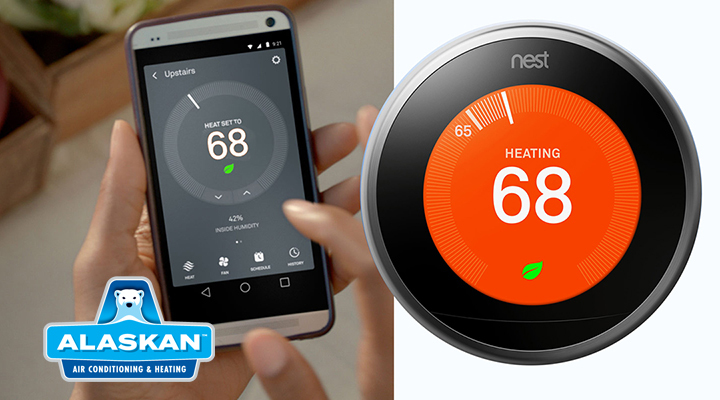 Many of our higher efficiency replacement HVAC system come standard with a Wi-Fi thermostat. 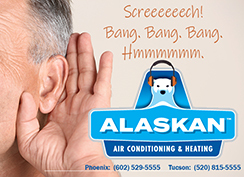 Or, if you want to replace your old one with a new smart model, give Alaskan Air Conditioning and Heating a call.